Rob McCarthy was born in 1946 in Adelaide South Australia. During the early 1960s ‘folk boom’ he sang and played folk blues guitar and 5 string banjo in the Pete Seeger folk style in coffee houses. Rob had early bluegrass recordings of Earl Scruggs and Lester Flatt and the Stanley Brothers, and was also inspired by old recordings of Clarence Ashley, the Carter Family, and Uncle Dave Macon. This began a lifelong love affair with bluegrass and old-time country music. Rob learnt the basics of old-timey and bluegrass banjo by slowing down the old recordings and jamming with other Aussie pioneers like Trev Warner and the late Rick Adams. Other influences were ‘The New Lost City Ramblers’ who performed in Adelaide in 1965. At this time, Trev, John Munro, and Rob formed the ‘Skillet Lickers’, named after the famous hillbilly string band of the 1920’s. In 1967, the band featured at the first Australian National Folk Festival held in Melbourne. They appeared with Australia’s first full bluegrass band, ‘The Hayes Brothers and the Bluegrass Ramblers’. Soon after, Trev rejoined with Rick and Dennis, Adelaide’s other early bluegrass group. Rob had won a couple of talent quests, and performed solo on Reg Lindsay’s Country and Western Hour. He then reformed the ‘Skillet Lickers Bluegrass Band’ and they appeared on Reg’s national TV show. The band was offered a weekly spot, where they performed for nearly 3 years as show regulars appearing over 100 times. They were offered a recording contract with EMI and released a single and EP produced by Eric Dunn. These recordings sold well and received good reviews from Bluegrass Unlimited in the USA. 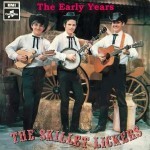 The ‘Skillet Lickers Bluegrass band’ consisted of John Munro on mandolin, Brent Miller on guitar, and Rob on banjo. The band was joined by Len Cohen on Dobro and bass. He had been a member of the NZ group, the ‘Hamilton County Bluegrass Band’. The ‘Skillet Lickers BG Band’ was known for its tight harmony singing and hard-driving instrumentals. They featured at several National Folk and Country festivals and had their own half hour 13 week TV show on ABC TV. The band was renamed ‘Country Express’ and soon after Rob formed a gospel group, the ‘Country Gospel Bluegrass Band’. This group performed for over 15 years and released three albums. After a break of several years, Rob rejoined the bluegrass community and teamed up with his son, Chris and long time friend, Geoff Bridgland, to form the ‘Wombat Holler String Band’. The group released an album, called ‘Old Time Southern Melodies’. During April and May of 2004, Rob toured Appalachia and played at ‘Merlefest’ in the Blue Ridge Mountains and an old-time festival in the Smoky Mountains, as well as visiting and jamming with pickers in Tennessee, North Carolina, and West Virginia. Highlights were meeting his idol, Earl Scruggs, visiting the Carter Fold, home-place of the Carter family in the Clinch Mountains of Virginia, and Jerusalem Ridge in Kentucky, the home-place of Bill Monroe. 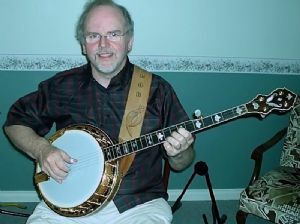 In January, 2005, Rob helped start the regular monthly Bluegrass and Old Timey Jam held in an Adelaide RSL Hall, which was well attended by pickers and singers of all levels. This helped to revitalise the SA Bluegrass scene. He now runs a twice monthly Old Time Jam in a warehouse with around 20-30 pickers. He’s still learning lots of tunes (mainly Old Time fiddle tunes) and trying to keep to keep his sense of humour as he gets older. My name is Damian and i took your basic banjo course at Mawson Lakes a couple of years ago. I’m interested in getting some one on one lessons as soon as possible and was wondering if you know anyone that might be able to help me out. My skill level is still very basic but i am incredibly keen to start learning more. Any leads or information you might be able to give would be much appreciated. Hi Damian, don’t know if you ever had a response to your question, so thought i would volunteer some info – if it is helpful. Apparently the Old Timey Music crowd is moving soon to new premises at the Prospect Town Hall (Folk Music Federation of SA headquarters). Not sure of details, but the Folk Fed should have those on it’s website, plus some useful contact numbers. Otherwise, the Whitmore Hotel is supporting a lot of bluegrass/old timey music these days. It’s a friendly crowd and should be easy to meet up with someone there who can help with your lessons… good luck!